When it comes to getting people to watch online videos from media sites, Google is still the largest source of outside traffic. Search drives views. 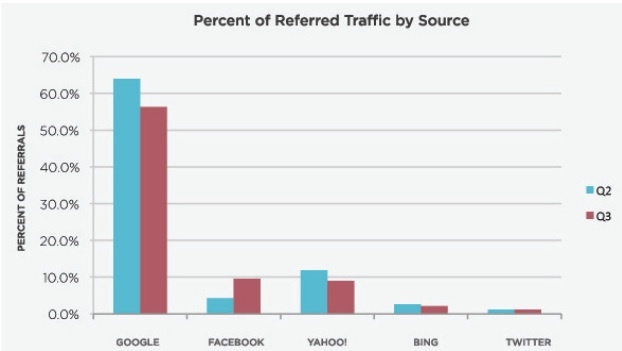 But the second largest source of traffic is not Yahoo, Bing, or another search engine. It is now Facebook. According to a report on Online Video & The Media Industry put out jointly by Tubemogul and Brightcove, Facebook passed Yahoo in the third quarter to become the No. 2 source of traffic to online videos at media sites. (The study measures videos across the Brightcove network, with a focus on newspaper, magazine, broadcaster, brand, and online media sites). In the third quarter, Facebook shares accounted for 9.6 percent of online video traffic. Google still towers above Facebook with more than 50 percent of the referring traffic coming from search, but that is down from the second quarter when it was above 60 percent. In fact, across all search (Google, Yahoo, and Bing), referral traffic to videos on media sites is down. 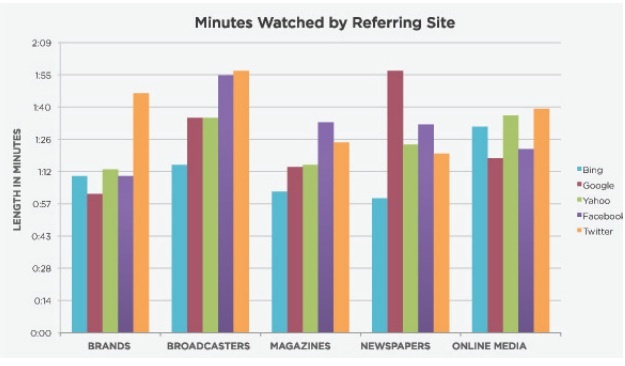 When it comes to actual engagement in terms of minutes watched, however, viewers coming from Twitter watch longer on average than people coming from either Facebook or search. Twitter’s higher engagement is something Tubemogul has been tracking for a while. But when you break down engagement by different type of media sites, you get more of a mixed bag. Twitter shares result in longer video views for broadcasters, brands, and online media (the orange bars in the chart below), but people coming from Facebook watch longer on magazine and newspaper sites (the purple bars). And Google (maroon bars) still beats both for time spent watching videos on newspaper sites. If you think about it, that makes sense since people go to Google looking for timely information, so they are more likely to watch a news video for a longer period of time coming off a search than, say, an entertainment video. In all of these cases we are talking about average time spent watching of less than 2 minutes, so it is all relative. The report has all sorts of other good data on how different types of media sites are doing when it comes to online video. The entire report is embedded blow.